Choose live removal over bee extermination. Bee exterminators often charge more to exterminate bees than a live bee removal and relocation company. Nearly 1/3 of world food supplies is contributed by pollination from bees. Todays world is a harsher world for the honeybee. By not exterminating honeybees you help the survival of the bee species. By removing bees alive you can likely have the beekeeper give you honey from the bee farm. Raw honey has health and medicinal benefits. US bee hotline. Exterminators seldom remove the beehive and honey in the wall, roof, or eve of structure, leading to additional problems with critters, rodents, bugs, and potential staining with structural damage. 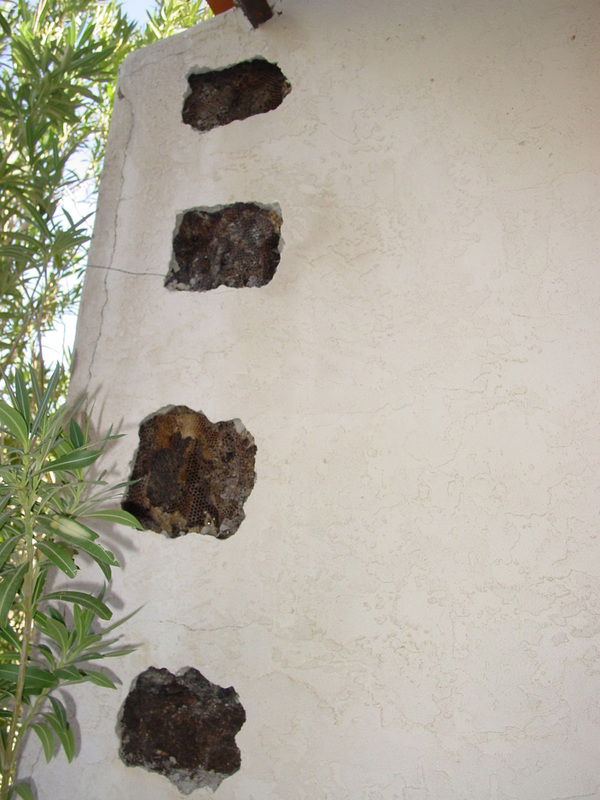 Recurring bee problems are caused by not removing the actual beehive and honeycomb. Typically exterminators are pest control technicians that lack the expertise and knowledge that a bee removal company has. Visit the self help page to learn how to get rid of bees, based on the area of or location of the bee nest. Save the chemical for modern warfare. Exterminators throughout the US that kill bees for profit do not help (CCD) which is lowering the amount of healthy bee activity in the world. It is estimated that of the food we eat, nearly a third is from the pollination work bees do. Major cities within the US: Los Angeles, Long Beach, San Diego, Orange, Riverside, San Bernardino, Ontario. San Jose, San Mateo, San Francisco, Oakland, Sacramento. Reno, Tucson, Phoenix, Tempe, Mesa, DFW, Dallas, Fort Worth, San Antonio, Austin, Houston. New areas include: Albuquerque, Atlanta, Baltimore, Boston, Buffalo, Colorado Springs, Charlotte, Chicago, Cincinnati, Cleveland, Columbus, Denver, Detroit, Indianapolis, Jacksonville, Kansas city, Lexington, Long Island, Louisville, Memphis, Miami, Milwaukee, Minneapolis, Nashville, New York NYC, New Jersey, New Orleans, Newark, Oklahoma City, Omaha, Orlando, Palm Beach, Philadelphia, Phoenix, Pittsburgh, Portland, Raleigh, Rhode Island, Santa Ana, Seattle, St. Louis, Tacoma, Tampa Bay, Trenton, Virginia Beach, and Washington DC. call to confirm availability or visit the bee removal home page to find your area.